What makes employees want to engage and interact with some digital training courses more than others? How could you use game design principles to deliver a great learning experience while also tracking and assessing performance? In Office Arcade, Jason Suriano answers these questions (and many more) by providing practical examples of the four key principles to breakthrough with corporate gamification – engagement, trajectory, ubiquity, and data. Engaging employees at their own pace and place, while leveraging devices like an employees iPhone, guarantees that a gamified eLearning course reaches its ultimate goal of training and assessing the employee. Using points and badges, a properly designed gamification course will relay important employee performance metrics to the organization. Office Arcade is based on Jason’s 15 years of research, consulting, and hands-on production experience in the creation of over two hundred digital projects for companies like Discovery Communications. Jason wrote Office Arcade to help with the confusion around gamification – it can be simple, clear, and effective for employers and their employees. 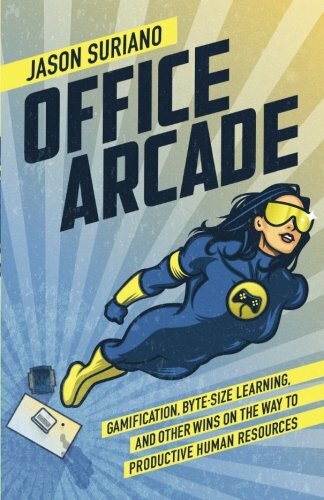 Office Arcade is written for Human Resource managers, corporate trainers, instructional designers, eLearning specialists, product managers, marketers, and anyone who is looking for a simpler way to understand how to use gamification in their projects.